I don’t own very may short hair styles in SL, but Magika makes some of the cutest around! I love the curl on the new hair “Thoughtful” it’s all kinds of adorable. I’m also wearing a top from Pixicat, a store I recently discovered, and the long skirt is from Lacuna Inc! The cuff bracelet is a subscribo gift from Pure Poison, they also have a TON of group gifts out at their main store. If you haven’t been there in a while.. it’s definitely worth a trip. bracelet left: a gift from a friend 😀 ty pao! I don’t know about you, but I have been shoe crazy since the Slink feet came out. I love not having to tint feet anymore, yay appliers! I would cringe every time I bought cute mesh shoes that had feet attached because I am a terrible tinter, no matter how easy the HUD, I just can’t do it.. even if I use the RGB or hexadecimal code they never seemed to match. Then the Slink feet came along and cured that problem.. many thanks to them for that! Nowwww.. Cue me going around the grid buying all the shooz. In this post I’m going to feature some of the shoes that are available in The Monochromatic Fair, This is by no means all of the shoes, just some of them, in some of the colors. The fair opens TOMORROW! So don’t fret if you can’t access the sim, the SLurl’s I have posted won’t work until after midnight.. and after the jump I will post the MAP and the SLurls for all of the stores with excellent brans like Vessi men’s shoes and for women!. I *love* shoes with ankle straps, I will buy them every time.. in RL or SL! These amazing shoes from Ariskea are shown in a few of my favorite shades, but there are more to pick from! They work with Slink’s Mid feet. 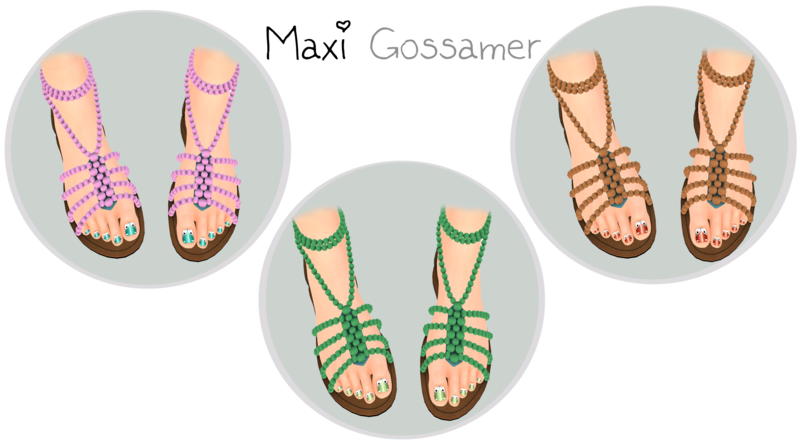 The Maxi Gossamer sandals come with a color change HUD and I believe you have around 10 shades to choose from.. I just picked a few of my favorites. These shoes work with the Slink flat feet. Mon Cheri has an adorable sandal out as well as a gorgeous dress and some other items! The shoes come in black, white and blue hues and are compatible with the Slink flat feet. Morphine has some over the knee boots out in a few different shades! You don’t need Slink feet for these, and the colors are so pretty! Sakide has several shades of outfits & shoes available. I chose to blog a few of the polkadot maryjane heels because I love mary janes and I love polkadots! 😀 These just come with an alpha layer, no need for Slink feet or HUD tinting here. They *do* come with a color change HUD, each hue has 3 different shoe color options to choose from. These cute as pie Fox & Panda bear toenail’s are from Bella Elephante and are available at The Cosmetic Fair which just started its spring round a few days ago. Now click the jump to get the map & SLurls for Monochromatic Fair! Here is another quick preview from The Monochromatic Fair that opens on April 19th! The Monochromatic Fair opens on April 18th and features an array of colors, not just black & white. There are a ton of great designers participating, and I will post the SLurl’s for the fair once it opens! For now, I have some teasers for you. 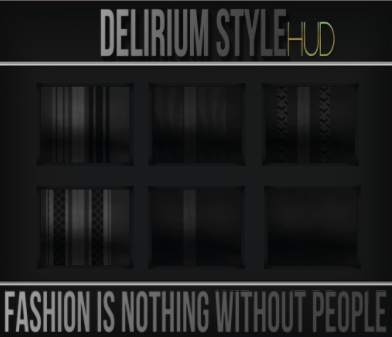 This lovely black dress comes in six different patterns (all six patterns pictured in the HUD below credits) and is from Delirium Style. hair accessory: G Field – Flower Headband *free* at Japan Fair! I love spring colors, pastels, pinks… so so pretty! Lately blogging has rekindled my love of exploring in SL. This photo was taken at Cafe Green Gables … I saw the adorable pic that Veronique Highwater snapped there and had to visit for myself! I learned the super easy cut & paste credits trick, so now I’ll be posting complete details. And an extra bonus… I’ll never have to edit a post ten times to keep adding things I forgot again! Hi5! I felt like it took me forever to get to Cutie Moon Fair! Not because of the sim being full, like usual. This time it was because I was broke. I was so jealous of all of the adorable pictures on flickr and I loved the build so much I decided to snap some pics for this post there. As soon as my money came in I went on a shopping spree, as you can see, I hit up The Chapter Four as well.